Historian Jean-François Soulet affirms that for the past 6,000 or 7,000 years Pyrenees history has mingled with pastoralism: “The Canigou Mountains in Cataluña, Mont Valier in Ariège, Mont-Perdu and Irati-Okabé in the Basque country, are the historic witnesses of the most active Pyrenean pastoralism.” Nowadays, pastoral practices play a vital role in biodiversity, landscape management and co-management of the ski areas. From mountain pastures to valleys, from Cataluña to Basque country, the Pyrenean life is punctuated by the tinkling of animals’ bells, mostly sheep flocks. In summer, hikers can find them in mountain pastures, during transhumance they can be followed in many Pyrenean valleys, at the end of spring for the climb to mountain pastures or at the beginning of fall for their descent. From all the French mountains, the Pyrenees are the one where pastoralism has a dominant place, with about 80 % of the agricultural area dedicated to livestock farming and herd of approximately 580,000 heads, mostly milk-ewes. 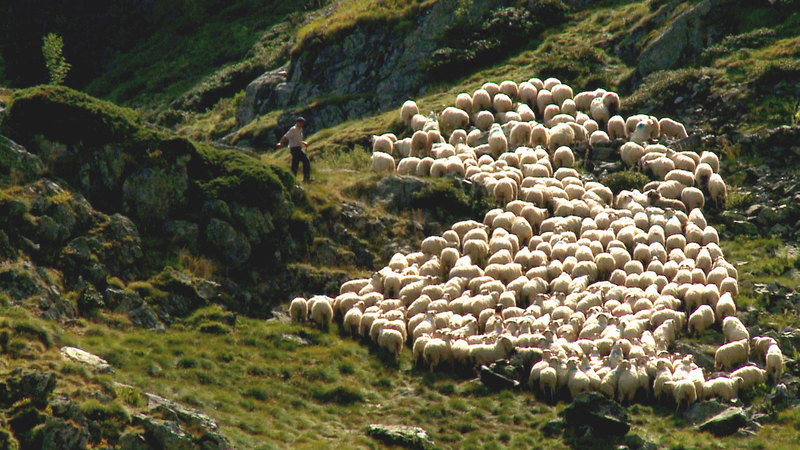 During summer, shepherds keeps their flocks in the mountains for months, often alone in their huts named “orri” in Ariege and the Hautes-Pyrenees, “cortal” in the Conflent, “cuyalaa” in Bearn or “cayolar” in the Basque country. Pastoralism maintains landscapes and contributes to ecosystems diversity. In some ski resorts in summer, for example in Peyragudes, flocks are used for slopes maintenance. Pastoralism forms part of the Pyrenees’ DNA. As such, ancestral agreements of “lies and passeries” have been in existence for centuries and still link shepherds from both sides of the border. In Oloron-Sainte-Marie, a high school for mountain activities provides a shepherd training course , and in Azet, the Pyrenean house of Pastoralism will teach you everything there is to know about this ancestral practice.